Why was a fortified town built on the lower Chattahoochee River in southwest Georgia around 1100 AD? Known as the Cool Branch Site by archaeologists, it was the first “Mississippian” town in that part of Georgia. 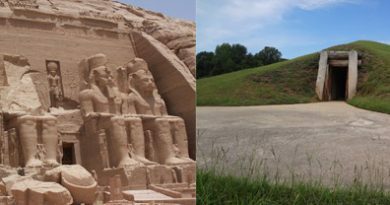 The Mississippian culture was a Native American culture that built towns featuring earthen pyramids built around central plazas. These villages were often surrounded by a palisade wall made from upright logs sharpened to a point at the top. 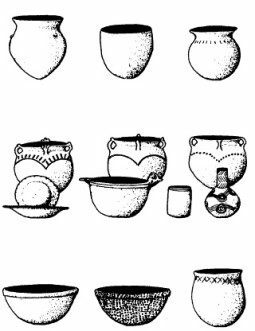 Mississippians also produced pottery in different styles and using a different method (shell tempering) than other native groups. They also shared a construction technique of building prefabricated walls which they erected by placing the bottom portion in a pre-dug trench that was then back filled providing stability. Finally, Mississippians also shared religious iconography featuring feathered serpents and eagle men. Archaeologists have argued for years over how the Mississippian culture developed. One group has held that Mississippian towns have all the traits of being built and inhabited by foreign tribes. Some have even argued that this culture had its ultimate origins in Mexico although not all archaeologists who agree with the “invasion” theory support the Mexican origin theory. These claim the invaders simply came from powerful Mississippian settlements to the west such as Moundville in Alabama or Cahokia in Illinois. The second theory is that Mississippian culture was the result of natural cultural evolution of local tribes. As these tribes grew in size and faced similar challenges they responded in similar ways resulting in what we call the Mississippian culture. Cool Branch was not the first Mississippian site in Georgia. That honor goes to the Ocmulgee Mounds site in Macon. (Evidence at this site also suggests it was created by foreign invaders.) But it was the first Mississippian site on the lower Chattahoochee River. 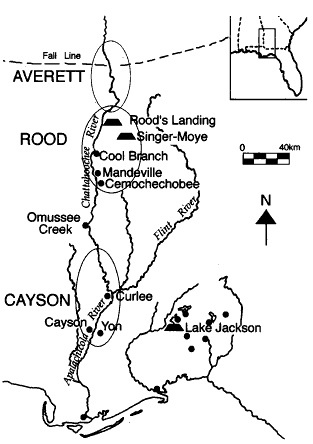 Distribution of Averett, Wakulla and Rood pottery on lower Chattahoochee River. (c) 2002 John Blitz & Karl Lorenz. Used under fair use provisions of copyright law. 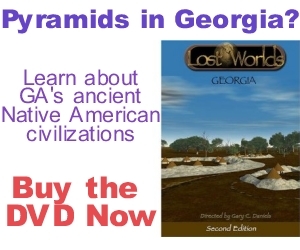 Researchers John H. Blitz and Karg G. Lorenz wanted to understand how the Mississippian culture emerged in this area of Georgia. Was it through evolution of local tribes or an invasion by a foreign tribe. They decided to test this idea using an ingenious method. First they mapped all the pottery styles along this section of the Chattahoochee River. What resulted was a map showing one type of pottery, known as Averett, dominated in the north around Columbus, Georgia and another type, Wakulla, dominated in the south near the confluence of the Chattahoochee and Flint rivers. Finally the Mississippian type, known as Rood, dominated in between these two types. Cool Branch Incised pottery style. (c) 2014 Georgia Indian Pottery Site. Used under fair use provisions of copyright law. Research clearly showed that both Averett and Wakulla had a deep history in the local area. Thus the people who made this pottery were locals who also had a long history there. But the Rood style pottery simply showed up all-of-a-sudden around 1100 AD and was more similar to styles from Moundville, Alabama than to these two local styles. 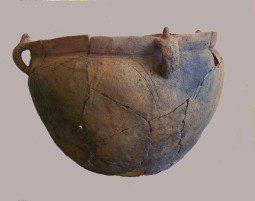 In fact, the researchers showed there was almost no overlap between these pottery styles– Rood style only showed up in Mississippian villages and Averett/Wakulla only showed up in their respective villages. Whoever these three groups were they didn’t appear to have much interactions with one another. Thus the researchers proposed that the Mississippians settled in an uninhabited buffer zone between two local tribes. The fact that there was no local culture in this uninhabited area which could evolve into Mississippian strongly supported the argument that the Mississippians were invaders. Plan view of the Cool Branch site (9QU5). (c) 2002 John Blitz & Karl Lorenz. Used under Fair Use provisions of copyright law. The Cool Branch site was surrounded by “an 850 meter long palisade wall with tower bastions spaced 35 meters apart.” <p.126> None of the Averett or Wakulla sites featured palisade walls. Thus whoever built the Cool Branch site felt it was worth the effort to cut trees and build a massive wall around the site. When the first Europeans landed in America, their initial settlements always included forts surrounded by walls. As these settlements grew and expanded into the frontiers this pattern would be repeated as walled forts were built first followed by settlements. The Mississippian culture followed this exact pattern along the Chattahoochee. The Cool Branch site appears to be the first fortified settlement which was then followed by more settlements. 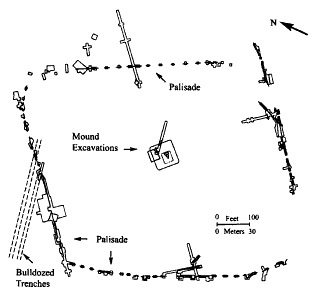 As the researchers concluded, “palisade construction was employed as a strategic technology to acquire and hold new territories on the Mississippian frontier.” <p.127> This settlement pattern further supports that the Mississippians were invaders. Averett (top), Rood (middle), and Wakulla (bottom) pottery. (c) 2002 Used under fair use provisions of copyright law. What were the results of this invasion? Since no Averett-style pottery was found in Mississippian sites and very little Rood-style pottery was found in Averett sites it seems clear these two groups had very little contact with one another. Averett sites do contain pottery styles from cultures just north of them thus they likely formed alliances with these tribes as a result of this Mississippian invasion. But by 1300 AD, two hundred years after this Mississippian invasion, Averett styles disappeared from the archaeological record. 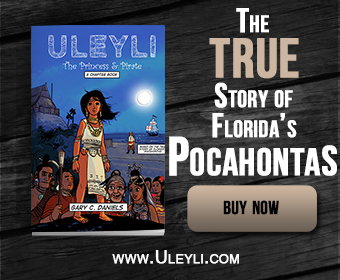 The Wakulla culture had a completely different response to this invasion. These cultures began to reorganize themselves in the Mississippian manner. 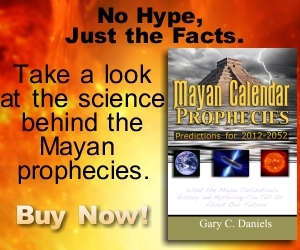 They began building villages with earthen pyramids like those of their new Mississippian neighbors. The Mississippians themselves expanded and built numerous other settlements throughout their new colony. 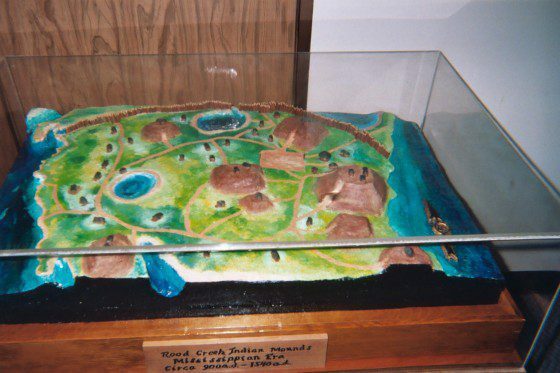 Sites such as Rood’s Landing and Singer-Moye would feature massive earthen pyramids and become some of the largest Mississippian settlements in Georgia attesting to the power of these invaders. Mound centers in the lower Chattahoochee- Apalachicola River Valley between 1100-1250 AD. 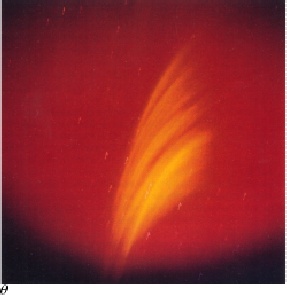 (c) 2002 Used under fair use provisions of copyright law. But what was the cause of this invasion in the first place? The fact that Averett villages to the north of Cool Branch appeared to have little interactions with the Mississippians and the Wakulla who were south between Cool Branch and the Gulf Coast had significant interactions suggests a possible motive for this Mississippian invasion: trade. 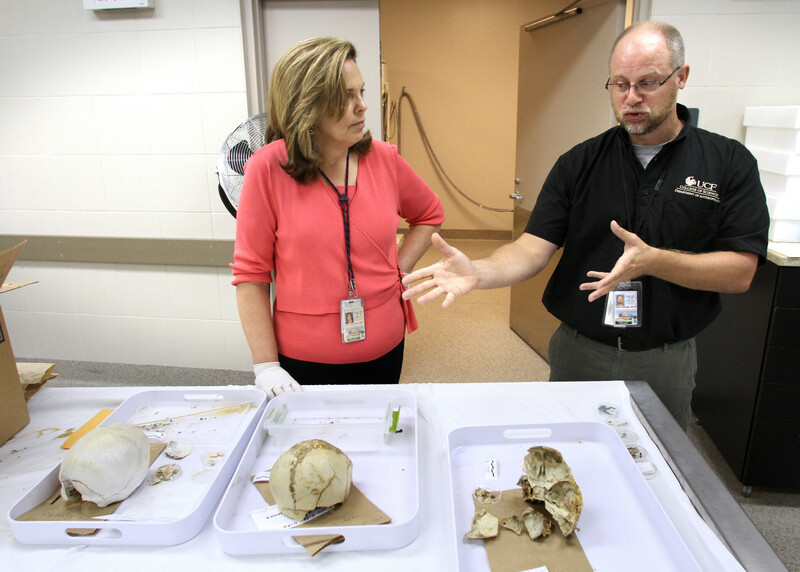 Seashells and salt were important trade items throughout most of North American history. The Chattahoochee River was an important trade thoroughfare for the transportation of shells and salt from the Gulf Coast to the mountains of north Georgia. Perhaps conflicts between the Wakulla and Averett cultures (as exemplified by the extensive buffer zone between the two cultures) had led to a breakdown in north-south trade. Perhaps each group was imposing their own tolls on trade canoes passing through their respective regions thereby driving up the cost of shells and salt. Perhaps they were manipulating the exchange rate between coastal products and mountain products demanding more stone axe heads for fewer baskets of shell or salt. Or perhaps the Mississippians simply wanted to monopolize this important trade and corner the market on seashells and salt. It doesn’t take much imagination to imagine what would happen if America’s oil providers in the Middle East stopped shipping oil to us or raised the price to something unacceptable. The U.S. government would undoubtedly respond by sending military force. In fact, our fortified military bases in the region were built to maintain the free flow of trade (i.e., oil). Thus it is likely the Mississippian invasion of the lower Chattahoochee was in response to trade issues as well and the fact that the focus of their interactions appear to be on the Wakulla to the south and not the Averett to the north suggests it was coastal trade products such as shells and salt that were their focus. Unlike the Averett culture to the north, the Wakulla culture would survive as a Mississippianized hybrid known as Fort Walton culture. They not only successfully adapted to the arrival of these outsiders but, in fact, outlived these invaders. After 1400 AD Fort Walton style pottery continued in popularity but the invaders’ own Rood style pottery disappeared. Apparently the Fort Walton culture began an alliance with a Mississippian culture to the east known as the Lamar culture centered at Macon, Georgia. This is revealed by the appearance of Lamar style pottery at the time of the disappearance of Rood style pottery. Thus after 250 years the Mississippian invaders were pushed out and the Wakulla-derived Fort Walton culture would once again control their homeland. 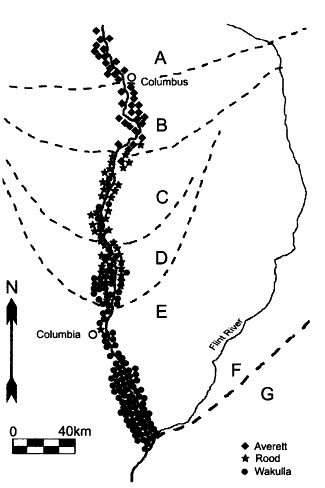 Source: “The Early Mississippian Frontier in the Lower Chattahoochee-Apalachicola River Valley” by John H. Blitz and Karl G. Lorenz in Southeastern Archaeology, Winter 2002.